Cell Transplantation | Stuart K. Williams Ph.D.
Building a new organ from biologic building blocks requires both cells and extracellular matrix – the bricks and mortar of the body. Our laboratory has evaluated numerous cell sources for tissue regeneration. Our major focus has been the population of cells that can be isolated from human fat tissue. Below is a scanning electron micrograph of a piece of fat isolated from a patient using a procedure known as liposuction. 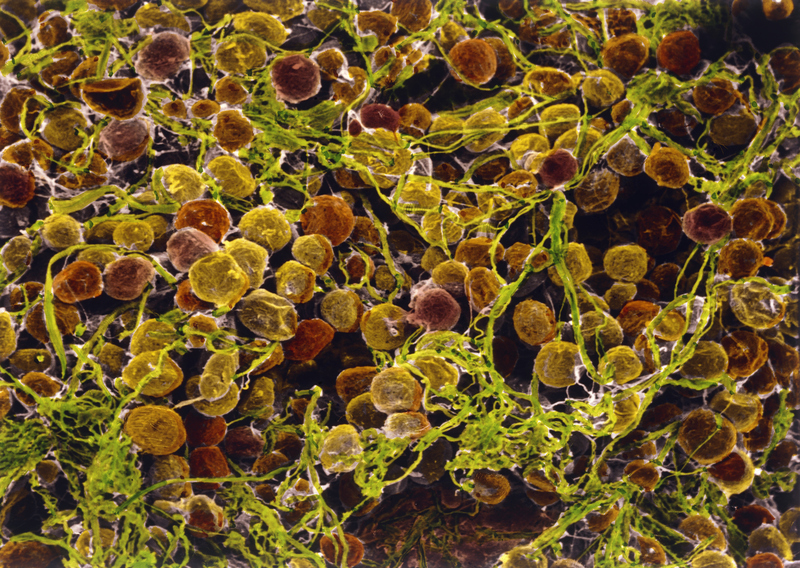 The fat cells are orange in color and the extracellular matrix that holds the fat cells together is a pale green. 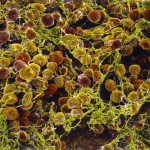 The regenerative cells found in fat are very small and not identifiable in this image. The origins of the procedure for the isolation of stem and regenerative cells from adipose tissue ar found in the work of Dr. Martin Rodbell who reported in the 1960’s the ability to use a mixture of enzymes, collectively called collagenase, to digest the extracellular matrix proteins that keep the cellular components of fat structurally intact. Robed reported that following treatment of the fat with collegians, and subsequent centrifugation, a pellet of streams and vascular cells results. Dr. Roger Wagner performed the first in-depth studies of the stromal vascular fraction (SVF) and identified numerous cell types including a large population of the cells that line all blood vessels – the endothelium. Dr. Stuart Williams, Dr. Wagner’s first Ph.D. student, continued the evaluation of the adipose SVF cell population, received the first US patents for the process of isolating the adipose SVF (US Patent #4,820,626 ) and performed the first intra-operative adipose SVF isolation to treat a patient with a cardiovascular pathology (Journal of Vascular Surgery. 11(3):468-475, 1990). The use of adipose derived stromal vascular fraction cell populations including the tissue culture derived adipose derived stem cells has seen explosive expansion and these cell populations are being evaluated for numerous pathologies. CNN GPS Moonshots for the 21st Century March 15th CNN GPS 10am and 1pm. Proudly powered by WordPress | Theme: Pink Touch 2 by Automattic.